Knowing where to start when it comes to modding your Mustang can sometimes be daunting. A great place to start is one of our custom built Lethal Performance Power Packages. These packages are the key first step to unlocking the full potential of your Mustang GT or Shelby GT500 without blowing your whole wallet. Each package includes performance parts such as cold air intakes, offroad mid-pipes, colder thermostats and are finished off with a custom tuned handheld device from one of the top tuners in The Tune Shop: Lund Racing, AED, Palm Beach Dyno or Li Racing & Tuning. All of this at a discounted price. Want more? We also offer complete, custom buildable supercharger packages for select applications! The 2018 Mustang GT, while still utilizing the 5.0L Coyote motor, brought a significant change in base horsepower as well as ETs and responsiveness to mods. We were in bottom 11s with a JLT intake & Lund Racing custom tune on E85 (and a noobie driver!). Check out the packages available for your 2018-19 Mustang, available with PMAS, JLT or Roush cold air intakes. Want to go bigger? We also offer custom supercharger packages for the 2018-19 Mustang GT! Choose from Whipple, Procharger, Paxton or Vortech and build your own awesome supercharger package at a discounted price. PLUS all of the packages are available with custom tuning from Lund Racing, Palm Beach Dyno or Li Racing & Tuning! Want to add a supercharger to your 2015-2017 Mustang GT? We also offer complete, buildable supercharger packages using Whipple, Paxton, Vortech & Procharger systems and tuning from Lund Racing, Li Racing & Palm Beach Dyno at discounted prices. The 2011 Mustang GT broke the internet (OK, not really...) when Ford introduced the 5.0L Coyote, which has become one of the most popular Ford power plants, being swapped into everything from pickup trucks to classic cars. The Coyote has major potential for horsepower and makes awesome numbers with just an intake, tune & exhaust. 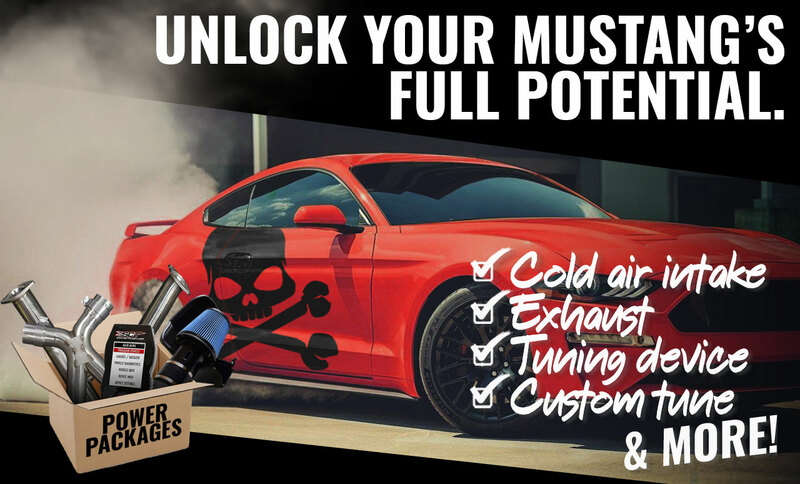 Check out the packages available for your 2011-2014 S197 Mustang GT, including packages with cold air intakes, headers & full exhaust. Want boost? We also offer custom supercharger packages for the S197 Mustang GT! Choose from Whipple, Procharger, Paxton or Vortech and build your own awesome supercharger package at a discounted price. PLUS all of the packages are available with custom tuning from Lund Racing, Palm Beach Dyno or Li Racing & Tuning! We have THOUSANDS of options for parts for your late-model Mustang & Ford. If the package setup you want isn't listed, give us a shout and let us build one for you.